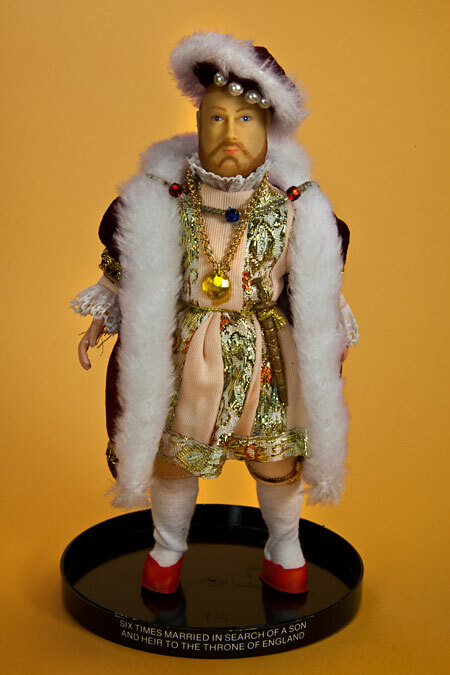 King Henry VIII doll. His head and torso are made from rubber, and he has plastic arms and legs. 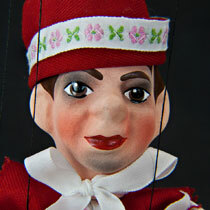 He is wearing a red velvet hat with white fur and pearl trim. His coat is also red velvet with white fur, and it has gold trim. Henry has a medal on a gold chain around his neck, and a sword on his belt. 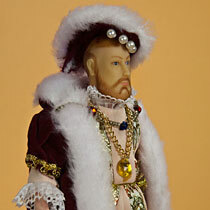 His tunic is made from a beige knit, with a lace collar, and it is trimmed with metallic ribbon. His knickers match his tunic, and he is wearing white knit stockings. 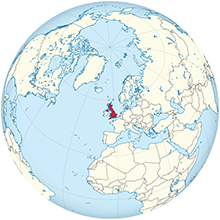 Stand says “Six times married in search of a son and heir to the throne of England.” England is now a part of the British United Kingdom. 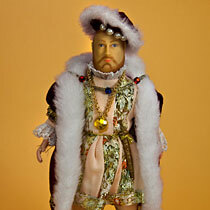 King Henry is wearing garments customary for the British culture at that time. 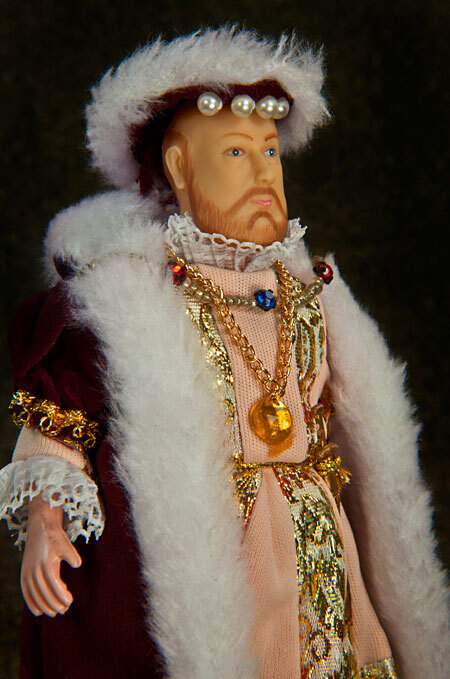 My name is Henry, actually, it’s King Henry the 8th (VIII). I had an older brother (Albert) who should have been the next king. 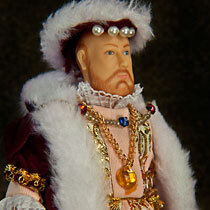 However, Albert died when he was 16, and I became King of England when our father (King Henry VII) died. I was a very active king, I loved to hunt, play music, and write poetry. I was also a very strong and spoiled king. With my power, I always found a way to get what I wanted. What I wanted most was to have a son. I wanted a strong boy who could be a powerful king when I died. As it turned out, having a healthy son was something that all of my power could not control. 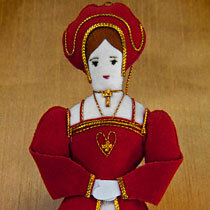 First, I married a Spanish Princess (Katherine of Aragon). We were married many years, but she only had one child, and it was a girl (Princess Mary). When Katherine became too old to have more children, I divorced her. 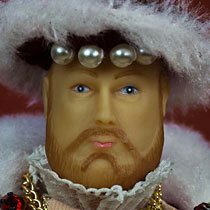 Then, I married a young woman named Anne Boleyn. She got pregnant right away, but the baby was another girl (Princess Elizabeth). After three years, I got tired of waiting for a son. Also, I heard Anne had other boyfriends. So, I gave the order to kill her, and the guards chopped her head off. I felt no regrets because I really wanted to have a baby boy. 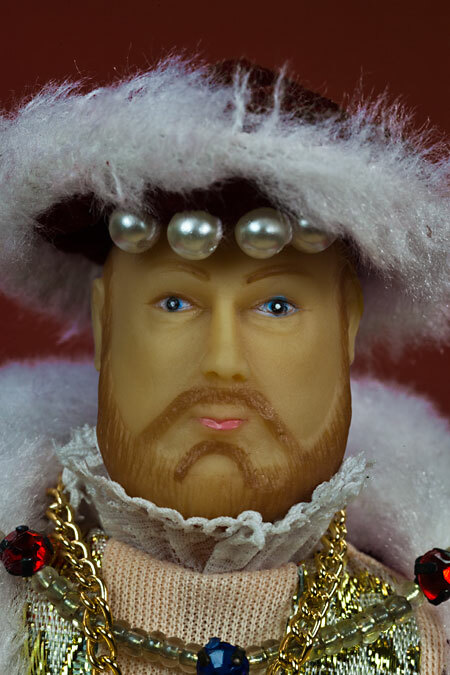 I then married Jane Seymour. Miraculously, she had a baby boy, and we named him Prince Edward. I was so happy! However, Edward was not a strong boy, and I was afraid he would not be a strong king. In addition, Jane died, so I looked around for another wife. Next, I married Anne of Cleves from Germany. However, I soon realized I made a terrible mistake because I didn’t speak German and I really didn’t like her. I quickly divorced her. My next wife (number five) was very young. Her name was Katherine Howard. What a beautiful, young Queen she was! By this time, though, I was very old and fat. Soon she was flirting with all the handsome young men at the royal court. I was furious and had her head chopped off. By now, my health was so bad that I could barely move. I was married one last time to Catherine Paar. We never had children, but she took care of me. 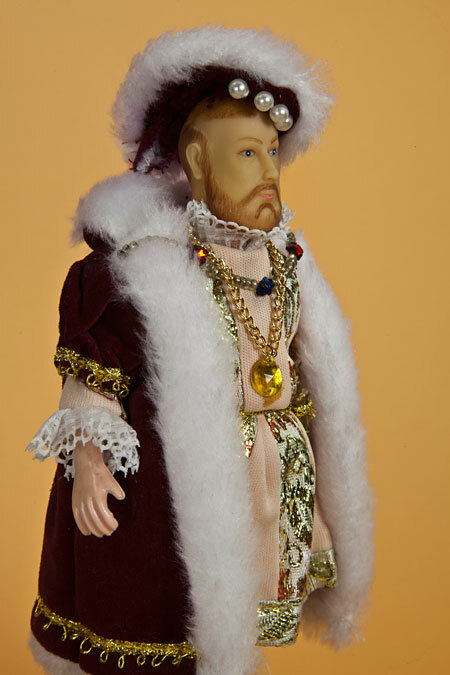 Four years later, I died and my young son, Edward, became King of England. He only lived a few years, then Princess Mary ruled for a short time, followed by Princess Elizabeth. Although I tried so hard to have a son, it turned out that my daughter, Queen Elizabeth, was one of the best rulers that England ever had!